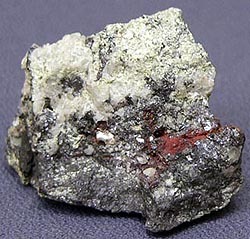 Red silver ore (silver blende). 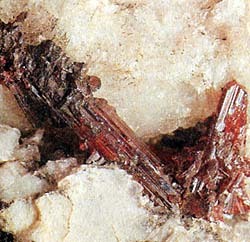 Collective term, uniting two family minerals: more light - Prustite Ag3AsS3 and dark - Pyrargerite, aerosite Ag3SbS3. Glance (glitter, glare) diamond to metalloid, transparent or thin. Colors: red or leaden-grey, in the thin fragments of ruby-red coloured. A line is bright red, purple-red. Fracture, break padman, rough, fragile frail brittle. Cleavage perfect absolute. Appears in leaden-silver deposits. Crystals (trigonal Crystal structure) are prismatic, often paired twin (duplex), there are also dense aggregates. Deposit minefield mine field occurrence subsoil: in Saxony (Germany), Czekh, to Spain, Canada, USA, Peru, Bolivia, Chile. Forms dense the masses or dissipated concretion and veins, although there are magnificent rare crystals, most precious for a collector. They have a prismatic habitus usually, but their form is determined the presence of numerous verges of rhombohedron and scalenohedron. Colors scarlet-red and red-carminic dark, with a tendency to black. Transparent, with diamond-metallic brilliance. There was opinion in the beginning, as though mineral contains gold, and that is why he was named the red real (or gold) ore.
Chemical composition (chemistry, compound). Silver (Ag) 65,4%, arsenic (As) 15,2%, Sulphur, Sulfur, Brimstone (S) 19,4%. Sometimes there are some vibrations in chemical composition. Transparency. Examines with x-rays red. Class of symmetry. Ditrigonal-pyramidal - Zt. Form of crystalline excretions. Dense downlow the masses, crystals are prismatic, scalenohedral. Cleavage. good (1011). On in course of time a silvery raid appears light. Fuse melt easily. A behavior is in acids. Dissolves in an aquafortis. Be found in the near-surface areas of argentiferous vein, lode, mines with galena, galenite and sphalerite. Very beautiful standards (measuring in a few centimetres) were delivered from Chanyarsilo in Chile, and also from the Ore mountains of Saxony and Bohemia and from Shvarcvalda, Vozzhi and Delfinato in France. In the USA found in many places in the states of Colorado, Nevada, Arizona, Idaho. In Sardinia discovered in the mine of Sarrabus in crystal-scalenohedron together with native silver, stephanite, Pyrargerite, aerosite, vitreous silver, Calcite.